A group of rock doves. The rock dove, sometimes simply referred to as a “pigeon,” can be found all around the world, and in some places is so common that it can even be considered a nuisance or pest. In Europe alone, where rock doves originated, there are estimated to be between 17 and 28 million feral doves living in the wild. In the United States, where rock doves continue to thrive since having been introduced in the 1600′s, the species can be found both in and around heavily populated cities, as well as in more reclusive areas like the Florida Everglades. Rock doves can be found on every continent except for Antartica, and it is perhaps this widespread nature that results in such a variation in their appearances. However, across the species, the average adult can be found reaching lengths of about 15 inches and with wingspans of about 24-28 inches. The heads of rock doves are a dark blueish-gray, with iridescence along their necks in shades of yellow, green, red, and purple. Rock doves also tend to have quite strikingly orange-yellowish eyes, which stand out even more so against their somewhat subdued body coloring. What is perhaps most interesting about their appearance is that the males and females of the species are nearly identical, a feature that is somewhat rare in the animal kingdom in general. Rock doves and their relatives are highly susceptiple to predation, and because they are so common in urban areas in addition to more natural habitats, they are likely one of the main sources of food for raptorial birds all around the world. They are also hunted by many mammals on the ground as well, and are considered a game bird in many cultures around the world. In Southwest Florida, where rock dove populations blend seamlessly with the human populations around them, the greatest threat to rock doves is said to be feral cats. Because pigeons have often been seen around major cities, scavenging for food seemingly wherever they can get it, they have often unfairly been associated with the spread of human disease. 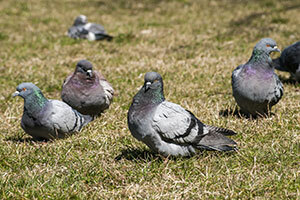 And while rock doves have been shown to carry certain diseases, they seem mostly unable to transmit them to humans. And while the presence of such birds in cities and towns around the world has led them to be considered a nuisance in some places, it is actually the release of domesticated pigeons into the wild by humans that has led to such large populations of feral pigeons in the first place. Over the years, rock doves have made somewhat popular pets for those willing to put in the training, and have proved to be intelligent and adaptable birds. There’s a good reason while you’ll see doves or pigeons of some variety used by magicians or as homing birds – this species is highly trainable for a variety of uses. Proving to be useful carrier birds, rock doves were even supposedly used during World War I, and it’s even reported that a few dozen special pigeons received medals for their services. Rock doves are just one of the many species of beautiful and interesting birds that you’ll find in the Florida Everglades, easily observable from a fun and exciting airboat ride. To view these birds for yourself and so much more that the Everglades has to offer, schedule an Everglades airboat tour for your family today! Previous story What is Molting and Why is it Done?